I wanted to see a little Hart and a big Johnson, but I didn’t want to look for ‘Sabrina, The Teenage Witch‘ slash fiction, so, at the blessing of the boss, I jumped into my truck, loaded with snacks, Ibuprofen, and my notepad, and headed to my favorite outdoor theater. The movie starts just like the trailer: Dwayne Johnson’s character, ‘Weirdich’ (pronounced just as you can imagine) is an awkward, fat Samoan Senior at Central High School, getting his groove on in the shower to an updated techno version of En Vogue’s ‘My Lovin’ (You’re Never Gonna Get It). He gets pulled from the shower by the story’s bully, Trevor, and his friends, throwing Weirdich fat and naked into a gym of students. Calvin “The Golden Jet” Joyner (Kevin Hart) is the only person to help him. Weirdich runs out. It’s the last time anyone remembers seeing Weirdich after that. Fast forward 20 years, and the melange of real life is boring the mind and destroying the soul of Calvin, the guy “voted most likely to succeed” by his peers in 1996. He was just skipped over for promotion, his marriage is rocky, and he’s the number-one accountant at a building “with a giant monkey out in front of it.” With the 20-year reunion looming, he receives a Friend Request from one ‘Bob Stone.’ As Hart puts it in one clearly ad-libbed scene: “This whole thing (movie) is Facebook‘s fault!” Joyner reluctantly accepts the Friend Request, and the movie’s real magic begins. The dynamic of Hart and Johnson was fantastic. What we expect here is a standard buddy-cop movie. There’s espionage, considering the CIA angle. There is a MacGuffin. It’s standard summer faire; two likable guys in an unlikely scenario, having to save the day. Don’t overthink this; it’s a money-maker not because it’s smart, but because it’s fun. But then, unexpectedly, it got smart (and heart, with an ‘e’). Smarter than it should have been, and emotionally pleasing at the finish. Johnson’s performance as Bob Stone, CIA agent, is better-than-expected in how he switches, almost manically, from big, bullied social cue-missing teddy bear to trained killer. Even when you know you’re on Team Good Guys(TMs), the script combined with Johnson’s acting, leaves you questioning if you’re betting on the wrong horse, almost all the way to the end. The script knows the tropes it’s playing with, and slightly tilts them in fun and unexpected ways. The movie takes a moral path through the psychological effects of high school bullying, and its long-term effects, from mental anguish, and later, motivation. “How’d you get in such good shape?” Hart’s character asks. 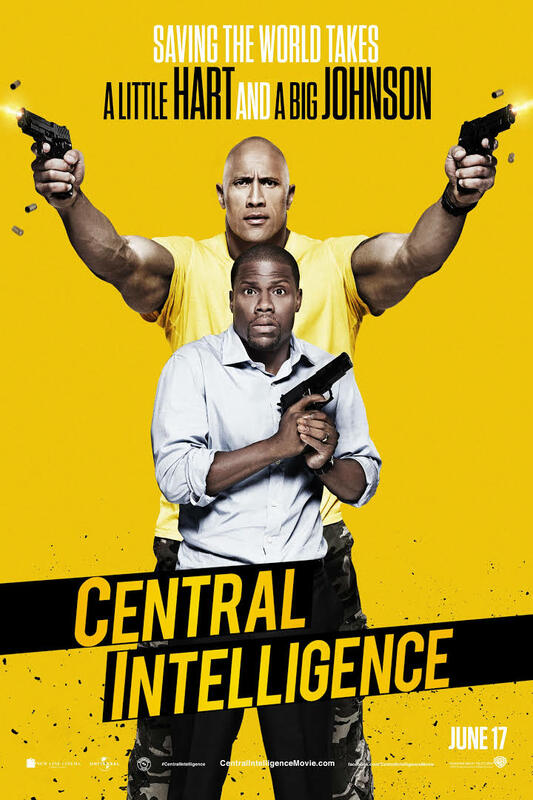 With Aaron Paul as Stone’s old partner, Phil, and a number of spoilerific cameos throughout the film that elevate the laughs, ‘Central Intelligence‘ delivers better-than-expected laughs pretty consistently throughout the near 2-hour film. Don’t misunderstand: it’s a standard money-making machine with two big, current stars, that draws from many of the movies it’s emulating. However, it’s still fun, pleasing, and generates some genuine laughs in some unexpected places. There was a great ‘Archer‘ reference. Stay until the credits roll. The outtakes are great.